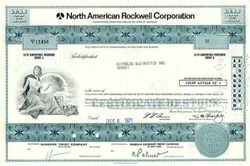 Beautifully engraved Stock certificate from the (Powerful) North American Rockwell Corporation Stock dated in the 1970s, which makes it 26 years old. The certificate has an ornate blue band boarder with a nicely engraved vignette of an allegorical woman with a globe in the background. In addition, this certificate displays the famous Rockwell Logo. The certificate has the printed signature of the Chairman of the Board, Willard Rockwell, jr. Rockwell has a tremendous history.